I would like to invite all polymer clay artists in the Philippines to join the first ever Philippine Polymer Clay Festival on May 15-16! Finally, an event that will bring together polymer clay enthusiasts from all over the country. I have been planning this in my head for a few years now. Late last year, I finally found someone to organize it with me! Expect a weekend of workshops, sculpting competitions, handmade exhibits, and fellowship! Here is a rundown of activities for May 15 & 16. Be part of history! Join the Clay Fest! 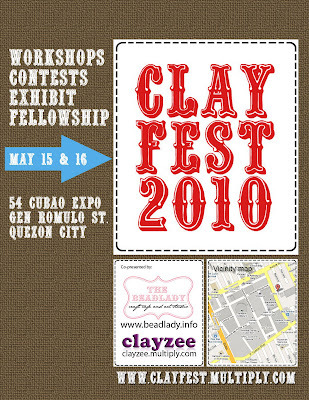 Visit http://clayfest.multiply.com or email angelisartbeads@gmail.com for more info. I've been quiet lately because I have been super busy with so many things, both crafty and non-craft related. But I'm taking a quick break to post a few photos of the polymer clay roses that my friend Rose ordered. I have always been fascinated with Chiyogami Washi. I have a stash of six or seven different designs, the size of gift wrapping paper. I never use these, because I do not want them to run out - they are so hard to find! A few years ago, I made polymer clay kimonos and paper jewelry out of the Washi. I have never used them again since, that is, until yesterday when all my new craft materials finally arrived. 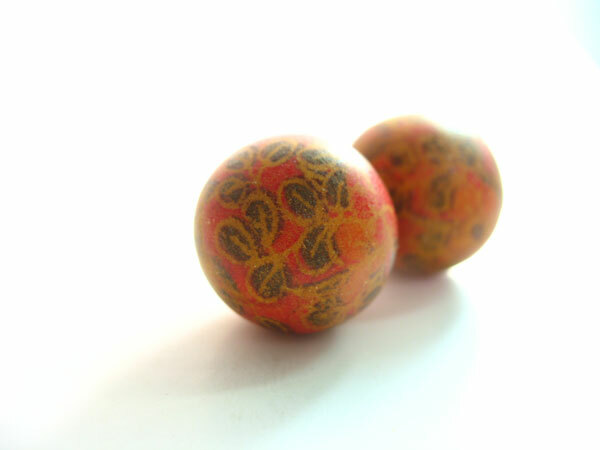 I made this set of polymer clay beads for the Progress and Possibilites competition organized by the International Polymer Clay Association. Not that I have any shot of becoming a finalist. I just wanted to try and enter my first ever competition. But I am sad to report that I do not have the funds to pay for the entry fee, much less a photographer. Sigh. And today's the deadliest deadline. Double sigh. I was intrigued by the colorful circus beads created by Lynda Moseley, which I discovered through Polymer Clay Daily. She only uses copy paper! How fascinating! I wanted to try transferring images onto a round surface, but using a different transfer method, and this is what I came up with. The round beads are very hard to make! I am still trying to perfect the technique. 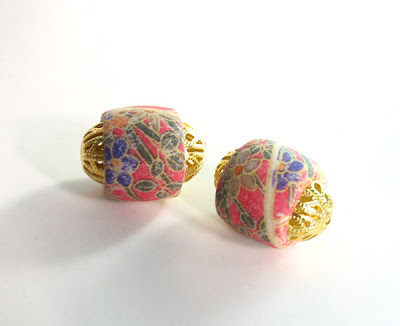 After baking, I individually handpainted the tube and barrel beads with Lumiere in Brass, to highlight the gold details that are on the original Washi pattern. This is my first shot at handpainting too, so the strokes are a bit sloppy. I need more practice. 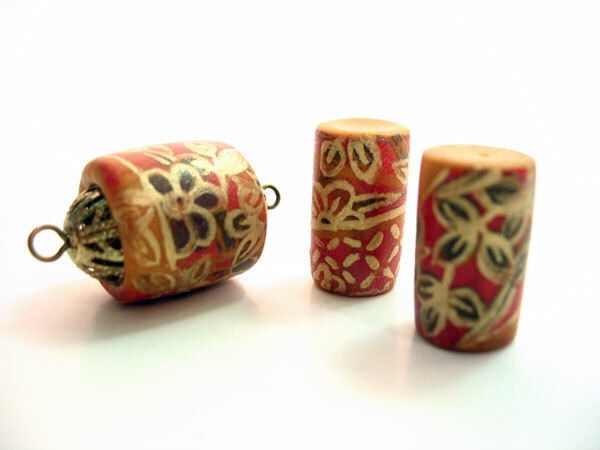 Here are a couple more barrel beads, still unfinished. I love making barrel beads! Here's a link to the first one I made in February. Kato Polyclay now available in the Philippines! I am so excited to announce that my stocks of Kato Polyclay have now arrived! 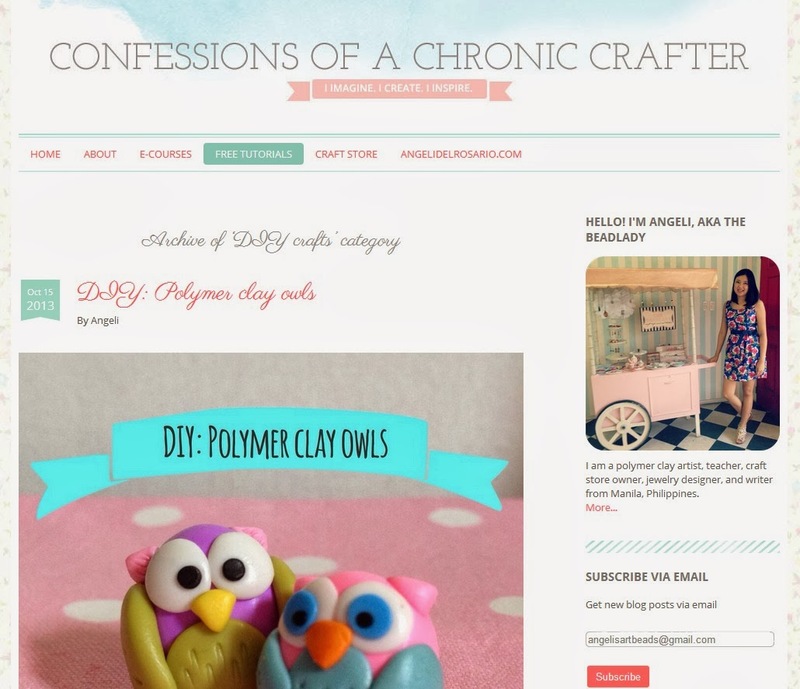 If you are a polymer clay artist from the Philippines, you have to check this out! You can order here. The clays are fresh from the Kato factory - not old stock bought from clearance sales - so you can be sure it's not hard and brittle. I prepared a starter kit which includes all 17 colors of Kato, plus a jar of Repel Gel, a bottle of Kato Clear Medium, and one NuFlex Blade. This is a great year for local polymer clay artists! More and more supplies are now available locally. When I was starting out, the only option I had was to ask relatives living in the US to buy me supplies (thank you for all the support titos and titas, hehe). I used to wait months for the clay to arrive! Now Kato is right here in Manila, so go buy a bar to try! I'd like to inform you that I won't be teaching the April 25 class at Powerbooks due to conflict in my schedule. 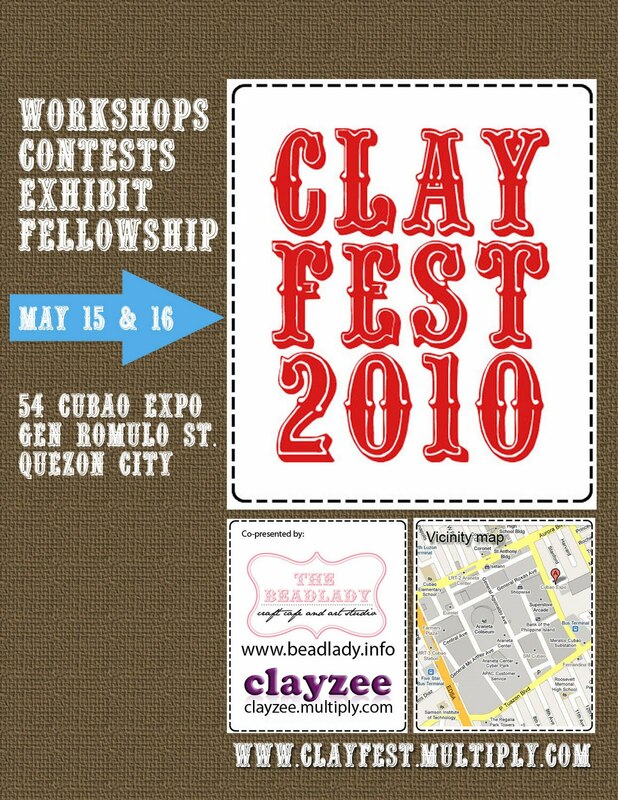 Instead, Charm Lacdao of Clayzee will be teaching the said class. 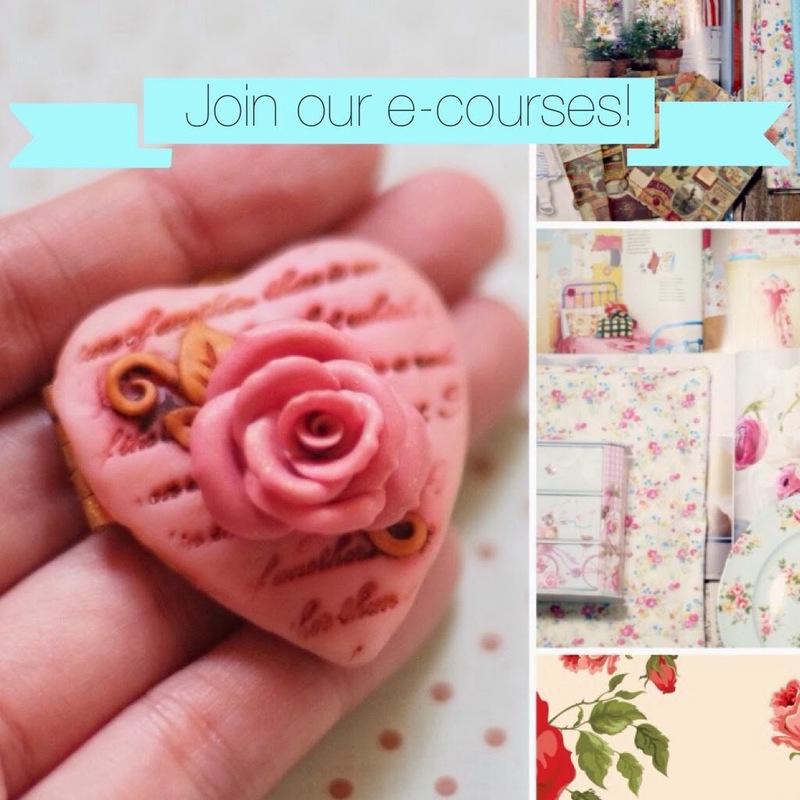 If you want to join my class, there's another one scheduled for May 2.